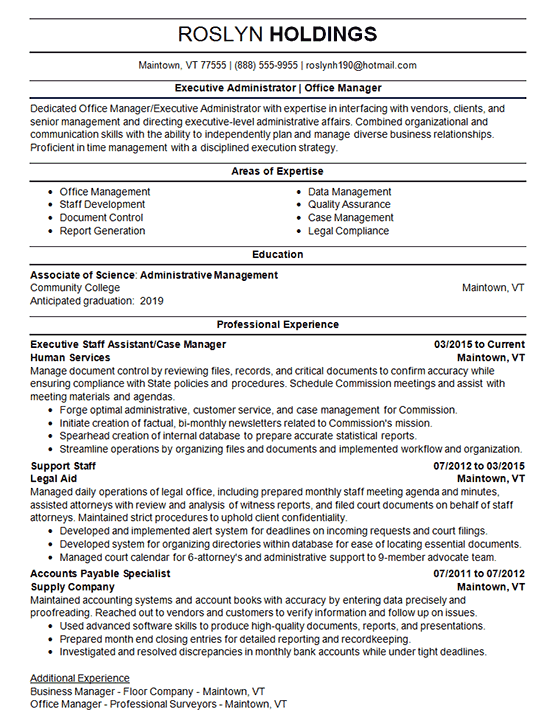 The basic resume for an Office Manager and Administrator is a good sample of a general resume. The document starts with a summary that showcases the job candidate’s senior management and executive-level administrative affairs experience. The “Areas of Expertise” section contains keywords appropriate to her experience for ranking high in applicant tracking systems. The client’s education is at the top of her resume to emphasize her upcoming candidacy for her degree. The writer selectively displayed her relevant accomplishments with bullet points. The accomplishments convey the scope of her achievements and contributions. Closing the resume with her additional experience. Dedicated Office Manager/Executive Administrator with expertise in interfacing with vendors, clients, and senior management and directing executive-level administrative affairs. Combined organizational and communication skills with the ability to independently plan and manage diverse business relationships. Proficient in time management with a disciplined execution strategy. Manage document control by reviewing files, records, and critical documents to confirm accuracy while ensuring compliance with State policies and procedures. Schedule Commission meetings and assist with meeting materials and agendas. Managed daily operations of legal office, including prepared monthly staff meeting agenda and minutes, assisted attorneys with review and analysis of witness reports, and filed court documents on behalf of staff attorneys. Maintained strict procedures to uphold client confidentiality.